Just regular folks. : Brookside gardens! Very exciting day! Jeremy got to ride a school bus today! 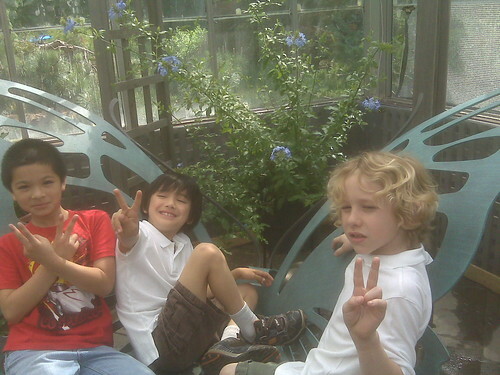 Vince's class went to Brookside Garden - our local botanical garden. The kids have been studying the life cycle of butterflies and the gardens have a live butterfly exhibit going on. I had signed up to volunteer to chaperone, but I had to go into Alexandria for work today, so Jeremy pinch hit for me (which I really appreciate because he is terribly swamped at work). There was only one other adult volunteer for Vince's class, which kind of shocked me because at Edda's school when I chaparoned on the farm trip, it seemed like there was an adult for every 4 kids. Based on that experience, I thought that I had volunteered for some sort of reasonable kid-management project. Alas, Jeremy spent the day wrangling 15 kids around the grounds. The weather was awesome, the kids had fun. 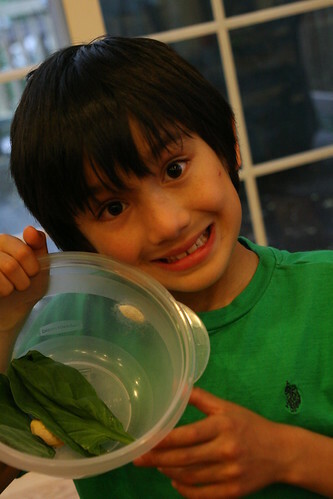 Because of this science unit pertaining to caterpillars, Vince has been collecting caterpillars from around the neighborhood and he brought one into the house last Saturday or Sunday. I asked him (maybe I pleaded) with him to release it into the wild as I was sure that it would die a slow painful death in the tupperware jar. He told me not to worry, that he knew how to take care of it and I shrugged and waited for the poor thing to die. On Tuesday, Vince showed me that he indeed knew what he was talking about as the caterpillar has been happy enough in the Tupperware container to settle down and make himself a fuzzy cocoon.